Click to view our new video and see what happens at our parties! She’s chic, she’s stylish, she’s classy – she’s Barbie! And she is here to make your child’s party a seriously fun affair! If your child loves all things Barbie, this party is perfect for her and her friends. Your entertainer will provide everything for the party, including the games, music props and prizes. All our entertainers come from a singing, acting, dancing or performance arts background to ensure that your child’s party is unforgettable! What happens at your Barbie Party? Your Barbie party host will sweep into the party and bring a whole new level of sophistication to your child’s special day. The first half of your party will include games, music and dancing, and when it’s time for lunch your guests will be able to enjoy glitter tattoos and special birthday face paints! After lunch there will be more games and dancing, and before the party is over, it’s time for cake and the magical birthday wish! Your party guests will be able to enjoy classic games like musical statues, pass the parcel, fun with the parachute and many more! Every guest will be involved and each child will win a prize too. Your Barbie host will also bring pirate or superhero games for any boys at your party. Heel, turn, swivel and smile! Your guests will strut their stuff to their favourite party tunes. Your guests will have plenty of time to get down and boogie, as well as playing musical themed games like limbo. All our entertainers come from a performance background, so this really will form a big party of the party. Whilst the children enjoy lunch, your entertainer will continue to interact with all the guests, applying glitter tattoos or mini face paints so that each guest is as chic and stylish as Barbie herself! The entire team at Especially For You Parties will work hard to ensure that your child’s birthday party is nothing short of perfect. View our testimonials to see what other parents thought about their party. What locations do you cover? 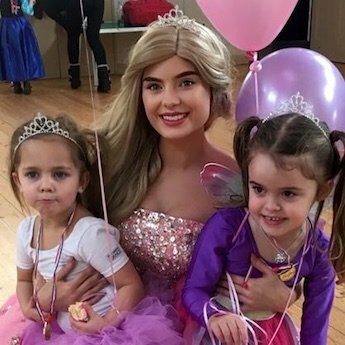 We provide Barbie parties throughout London, Surrey, Sussex, Kent, Essex, Hampshire, Buckinghamshire, Berkshire, Birmingham, Coventry, Nottingham, Cardiff, South Wales & Bristol, Manchester, Leeds and Edinburgh. Visit our location page to find your nearest local entertainer. Do you cater for boys? Yes, your entertainer will play a plenty of pirate or superhero games so everyone’s involved. Can I speak with my entertainer? Yes, your entertainer will call the week of your party. You can even choose which entertainer you’d like to have. Can I have the Barbie box? We don’t provide the Barbie box as standard, as we only have one available. We’re sometimes able to supply it depending on availability and your location. Contact us for more information. Locations: We provide parties all across the UK. 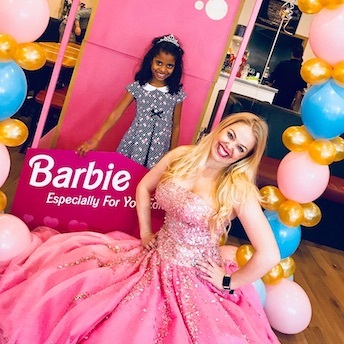 Our children’s Barbie Party locations include: London, Kent, Surrey, Essex, Berkshire, Buckinghamshire, Bristol, Hampshire, Manchester, Leeds, Birmingham, Coventry, Leicestershire, South Wales, Cardiff, Southampton and Bournemouth. Visit our location page to find out more.